Comedy Chow from Hollywood is returning to the Ventura Harbor Comedy Club on Thursday, August 16th at 8PM. 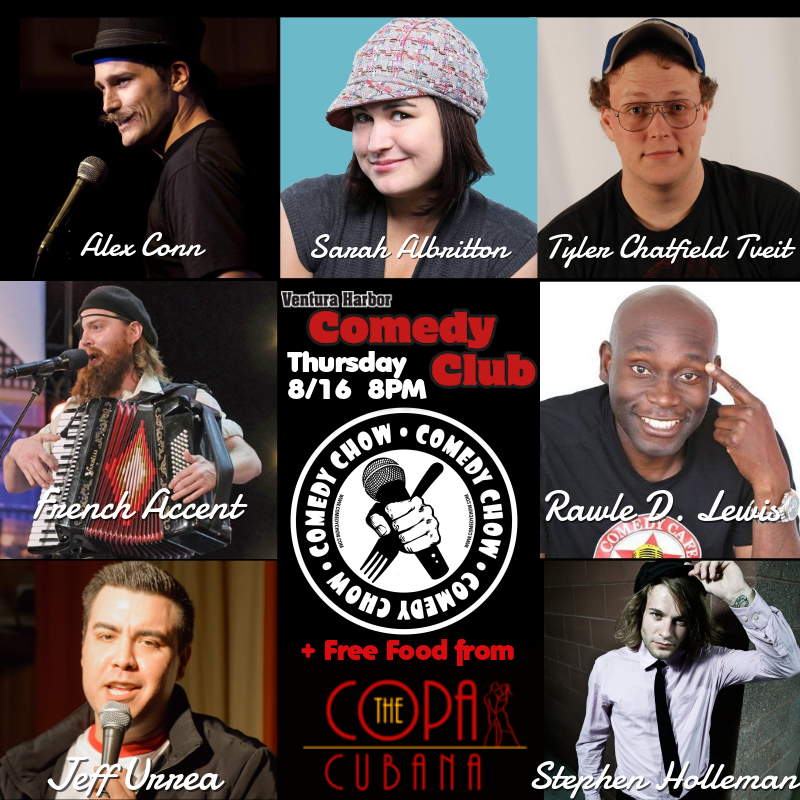 Featuring an All-Star showcase of national touring Headliners & emerging talent with FREE food from The Copa Cubana! Featuring performances by Rawle D. Lewis from Disney's hit film "Cool Runnings," and French Accent who just made his TV debut on America's Got Talent! Guest appearances by Sarah Albritton from the Sleeping With Sarah Podcast, plus Jeff Urrea, Alex Conn, Tyler Chatfield, and Stephen Holleman from Comedy Chow in Hollywood! Local comic Artie Lopez and Special Surprise Guest you won't want to miss! We are providing FREE food for the first 50 guests in attendance, courtesy of Andres Fernandez and The Copa Cubana in the Ventura Harbor! Doors open at 7:30PM with an 8PM showtime. Seating and food is first come first serve. This show's audio recording is being submitted for Digital Radio Broadcast, so please join the laughter and fun times at Comedy Chow at the Ventura Harbor Comedy Club!